This just may be my new favorite Chocolate Chip Cookie. It’s made with butter AND cream cheese. It’s dense, chewy, chocolatey and very delicious. I had half a package of cream cheese that needed to be used up and I really wanted chocolate chip cookies so I figured surely there must be a recipe… a quick google blog search led me to baking blonde and a really delicious recipe that’s definitely being added to my regular cookie repertoire! Cream together the butter, cream cheese and sugars until light and fluffy. Add the Vanilla. Sift together dry ingredients and then add them to the butter mixture. Beat until well combined. Stir in chocolate chips. Place a large scoop (about 2 tbsp) on the prepared cookie sheet and flatten slightly with your hand. Bake 12-14 minutes or until edges are looking light golden brown. Cool for 5 minutes on cookie sheets before moving to wire racks to cool completely. I love cream cheese in anything. This looks great! Wow, what a great idea! Never would have thought to add it to cookie dough. And it makes them look just like the ones at the store-so pretty! those cookies look like they would be super soft! Great looking cookies! i’d definitely recommend making these cookies if you like cream cheese & chocolate combo! I will try cinnamon the next time for sure!! Oh my. I didn’t need a new favorite cookie recipe, but I will make an exception with this one! So easy and delicious and dense and chewy and addictive. Plus, the no-egg recipe is great for guilt free dough consumption 😉 Gracias to the person that posted this link on Facebook! Cream cheese and melted butter? How interesting. I’ll have to try it. Cream cheese is one of my favorite ingredients. I don’t think there has ever been a recipe with it in it that wasn’t wonderful. Can’t wait for these! These are great, but I think there’s supposed to be an egg in the recipe… I added one and the second batch turned out better! I love the recipe as is without the addition of any eggs, I love that their so dense and chewy but I love that you’ve found an addition that works well for you! How do you get your cookies so perfectly circular!? Do you flatten them on the baking tray before they go in the oven? If my cookies come out of the oven looking too “puffy” I sort of drop the cookie sheet with the hot cookies on the counter a few times so they delflate a little bit which works great as long they’re a little bit underbaked. I”m not a fan of a “puffy” thick cookie! The cream cheese cookies have been flattened slightly before going into the oven as well! so yummy! I just made them (and ate almost all of them!) They were very easy to make and even more delicious then I could have imagined. Awesome, Thank you. I love cream cheese and chocolate. what could be bad! Look forward to trying the recipe. I absolutely cannot wait to make these. They look absolutely fabulous! Yes, you do need eggs for this recipe. Need that binder element. I’m sticking to it here…lol This recipe has no eggs and produces a dense chewy cookie that is uber delicious! I’ve made it a few times now and love it just the way it is! This is great! I’m always looking for new egg-less recipes since my son is allergic. Definitely pinning these, thanks for posting! Made a batch of these last night. I only had milk chocolate chips, so I used those plus some walnuts and Craisins. Excellent results. Thanks for this post. How different do you think they’d be with the full 5-6 oz of cream cheese? Made them last night! AMAZING!!! wow, what a treat! that picture is absolutely amazing, those cookies look totally delicious, never would’ve thought to use cream cheese, but can’t wait to test it out! I bet this recipe is good. 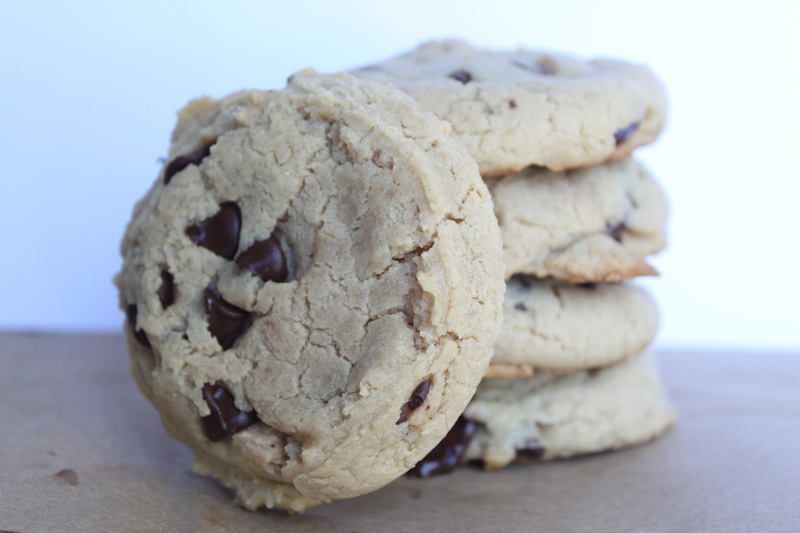 My favorite chocolate chip cookies are really similar, but without the cream cheese and with a few variations. I love cream cheese in brownies and frosting, but never thought about adding it to cookies. They look nice and thick, and delicious! I just made these cookies and I think they are absolutely delicious. I used 6oz of cream cheese and let the dough sit over night. I also used chocolate vanilla morsels and white chocolate chips. I love that they aren’t cakey! Thank you for sharing! I just made these and didn’t read that the butter was supposed to be melted. So I just made the dough like I usually do, with the butter soft enough to cream with the sugar and it worked just fine! Great recipe, thanks for sharing! These were so good, thank you! I added a little bit more than 4 ounces of cream cheese, but they were sooo good. Just made these cookies. I followed the recipie exactly. Very Good! The true critics will be home from school soon. Thanks for sharing. good question! I’m trying to get into the habit of adding the recipe yield as people have began asking but I honestly can’t remember…you should be able to get about 4 dozen cookies though, depending on size! I was able to get about 3-4 dozen cookies using about 1 tbsp of dough per cookie. If I used the recommended 2 tbsp of dough, I think I would’ve only gotten 18 cookies or so. The cookies were tasty although a little too sweet for me. Next time, I will cut the sugar by at least 25%. They were also super greasy as my parchment paper and baking sheet were soaked with butter after baking. Thanks for the info on the amount of cookies the recipe yielded! I’ve not had an issue with them being greasy, was your oven up to temperature when they started baking? That’s really the only thing I can think of that may cause them to leave so much fat behind? I have been making something similar with the addition of egg and grated orange zest for over 50 years (a recipe handed down by my grandmother). Yes, they do freeze well because my mother used to freeze them in tins in the utility room freezer and my father (in his 90’s) would sneak in the back door (daylight basement) and eat them straight out of the tin. Mom would go down to find a tin to thaw and it would be empty. What a fantastic story Jenny! Grated orange zest sounds delicious, I will have to give it a try! This looks yummy! I might have to try this for valentines this week! Have made these twice now and they turned out great! I did half the mix with no egg as stated and half with a small egg. Let me tell you if you like the denser more gooey type cookie go as is. If your looking for a more cakey type like other recipes then go with the egg as all it did was make it fluffier.Some said in other reviews the cream cheese makes it cakey but they are wrong it is the egg. I also did a mix with no egg and two tbs of orange rind zest and those are also very good if you like a slight hint of orange flavor just another way to enjoy this recipe. So eggless is the way to go here.. I also used a butter sub smart balance and cut it to 1/2 cup and used more fat free cream cheese a full 8 oz every time I have made them to get rid of some of the fat and seems to be just fine. a gooey dense cookie. First of all, YUM! I just made these today, but added egg and used 2 cups of chocolate chips. I also raised my oven temp to 375, because I like my cookies a little brown! They came out delicious! I love the cream cheese flavor. I am not a chocolate chip cookie lover, but these I love! My grandson graded them 100 %! I’m glad they turned out so well for you! I will have to try adding an egg! I was looking for a reciepe for some cream cheese cookies and found this one. All I have is white chocolate and buttetscotch chips, and want to add pecans. Do you think those flavors will taste o with the cream cheese ? I am going to try the eggless version. Thanks for the idea. white chocolate, butterscotch and pecan sounds like a great combination with the cream cheese! Enjoy! Thanks for the comment 🙂 This makes me happy! Just made these. Hot out of the oven. Can I just say…… OMG!!!! Yummy!!!!! Thank you for sharing your recipe. My mother in-law is already asking for it!!! I haven’t made these is quite some time and I really should bust out the cream cheese again 🙂 Glad you enjoyed! Wow! I had a half block of cream cheese and didn’t want to put it back into the fridge to dry out. I searched and found this GLORIOUSLY DELICIOUS recipe! I added 2 cups of semi-sweet chocolate chips and a bag of toffee bits. They turned out perfectly! Definitely did not need any eggs and were, by far, the best cookie recipe I’ve tried in quite a while. A definite keeper!